This illustration shows the diamond-like structure of the new, metastable, ultra-light crystalline form of aluminum. Image: Iliya Getmanskii, Southern Federal University, Russia. If you drop an aluminum spoon in a sink full of water, the spoon will sink to the bottom. That's because aluminum, in its conventional form, is denser than water, explains chemist Alexander Boldyrev from Utah State University. 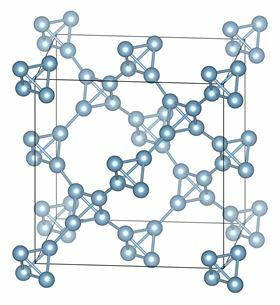 But if you restructure the common household metal at the molecular level, as Boldyrev and colleagues did using computational modeling, you could produce an ultra-light crystalline form of aluminum that's lighter than water. Boldyrev, together with scientists Iliya Getmanskii, Vitaliy Koval, Rusian Minyaev and Vladimir Minkin from Southern Federal University in Rostov-on Don, Russia, report their findings in a paper in The Journal of Physical Chemistry C. The team's research is supported by the US National Science Foundation and the Russian Ministry of Science and Education. The team's calculations confirmed that this would produce a new, metastable, lightweight form of crystal aluminum. To their amazement, this crystal aluminum has a density of only 0.61 gram per cubic centimeter, in contrast to convention aluminum's density of 2.7 grams per cubic centimeter. "That means the new crystallized form will float on water, which has a density of one gram per cubic centimeter," Boldyrev says. The low density of this crystallized form opens up a whole new realm of possible applications for the non-magnetic, corrosive-resistant, abundant, relatively inexpensive and easy-to-produce metal. Still, he says, the breakthrough discovery marks a novel way of approaching material design. "An amazing aspect of this research is the approach: using a known structure to design a new material," Boldyrev says. "This approach paves the way for future discoveries." This story is adapted from material from Utah State University, with editorial changes made by Materials Today. The views expressed in this article do not necessarily represent those of Elsevier. Link to original source.